Looking for a way to partner with parents at church and get them involved in their child's discipleship? Here's one way we do this. If you'd like more info. on our process for VIP's feel free to contact me. Do you guys use this at your church? How has the response been? Thanks! Yes we do. It has worked well. Of course, it is fueled by one-on-one asks to join the team. 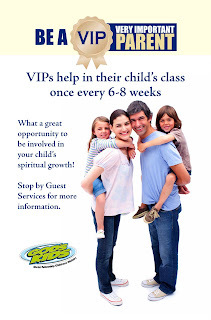 We approach parents individually and ask if they want to be a ViP. If you'd like our handouts, materials, etc. on this feel free to email me at daleh@cftoday.org and I'll be glad to share them with you.